Native to California, Mexico, and Texas. 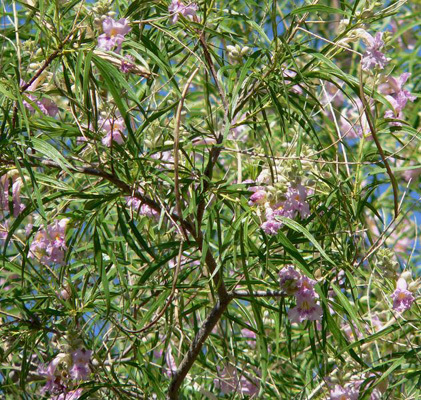 Desert Willow is a fast growing and attractive ornamental shrub or tree with showy blooms and willow like leaves. The leaves are opposite, or alternate, linear or linear-lanceolate 2" to 5" long. Medium green in color. Bark is grayish brown and becomes shaggy and twisted with age. Often multi-trunked, it can be trained as a single trunk tree. It has a fast growth rate and is drought tolerant. Fruit is a long woody capsule containing many flattened, oval, and feathery winged seeds 1/4" long. Easily reseeds itself in irrigated areas. 30' tall x 20' wide. Makes a good screen or specimen tree. It is very useful in erosion contol and extremely drought tolerant.